NEW DELHI: India was today officially declared ‘Polio Free’ by the World Health Organisation. India is one of the 11 countries in the South East Asian region which have been certified as being free of the wild polio virus. NEW DELHI: The Centre today told the Supreme Court that it has "no problem" with commutation of death sentence of Khalistani terrorist Devinderpal Singh Bhullar to life term. NEW DELHI: In a big setback to BCCI president N. Srinivasan, the Supreme Court on Thursday proposed his replacement by Sunil Gavaskar and suspension of Chennai Super Kings along with Rajasthan Royals from IPL 7 till the pendency of case of betting and spot fixing scandal before it. NEW DELHI: The Supreme Court today proposed Sunil Gavaskar's name as replacement for N Srinivasan as BCCI President and the batting legend said he will be "honoured" and "happy" to take this responsibility. LUCKNOW: Two suspected terrorists were arrested late on Wednesday near the railway station in Gorakhpur city of Uttar Pradesh. Less than a fortnight to go for the Lok Sabha elections starting April 7, the Congress today went all out against BJP’s “divisive” ideology, predicting another UPA win and trashing all opinion polls favouring the BJP. BJP prime ministerial candidate Narendra Modi today promised to carry forward the policies of former Prime Minister Atal Bihari Vajpayee so as to change the “destiny” of Kashmiris. 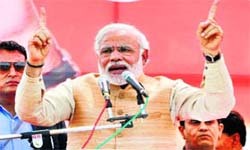 In an all-out attack on the Congress and the Aam Aadmi Party (AAP), Narendra Modi today said three AKs were being praised in Pakistan, but these were dangerous for India. The Central Bureau of Investigation has questioned Himachal Pradesh Chief Minister Virbhadra Singh in an alleged payoff case of Rs 2.8 crore received from a Mumbai-based steel company. The Supreme Court today rejected the Centre’s plea against the appointment of a 13-member special investigation team (SIT) headed by former SC judges - BP Jeevan Reddy and MB Shah - in an effort to bring back black money, estimated at USD 1.4 trillion (Rs 84 lakh crore), stashed in Swiss and other foreign banks. The Supreme Court today reprimanded the Uttar Pradesh government for not preventing the communal violence that had rocked Muzaffarnagar and Shamli districts on September 7, 2013, leaving 48 people dead and over 50,000 homeless. The Supreme Court today granted bail to Sahara chief Subrata Roy subject to payment of Rs 10,000 crore, but the group said it was “impossible” to mobilise such a huge amount when Roy was in jail and the group’s properties remained attached and bank accounts frozen.